Charleston, SC and Savannah, GA! Who could resist? Certainly not us, as our group of 53 eager travelers arrived in Charleston for the first leg of our tour. 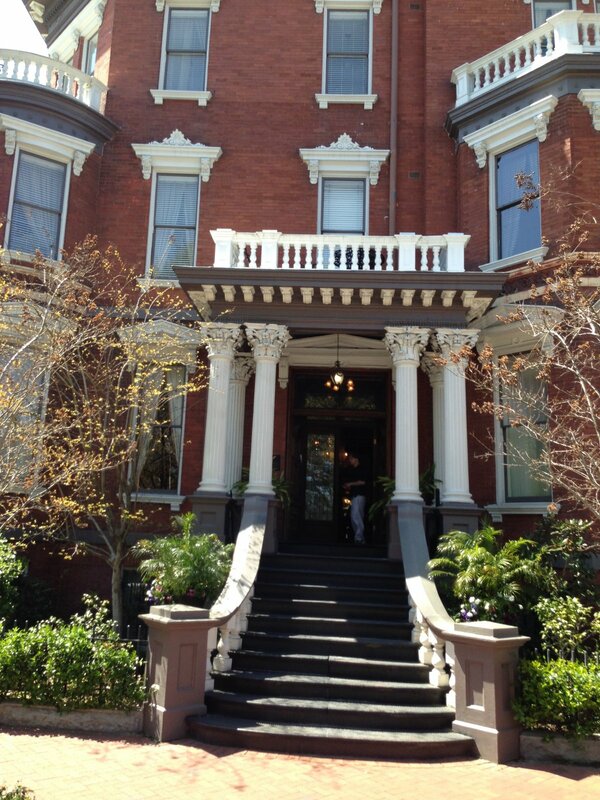 We stayed at a beautiful old hotel called The Frances Marion in downtown Charleston. 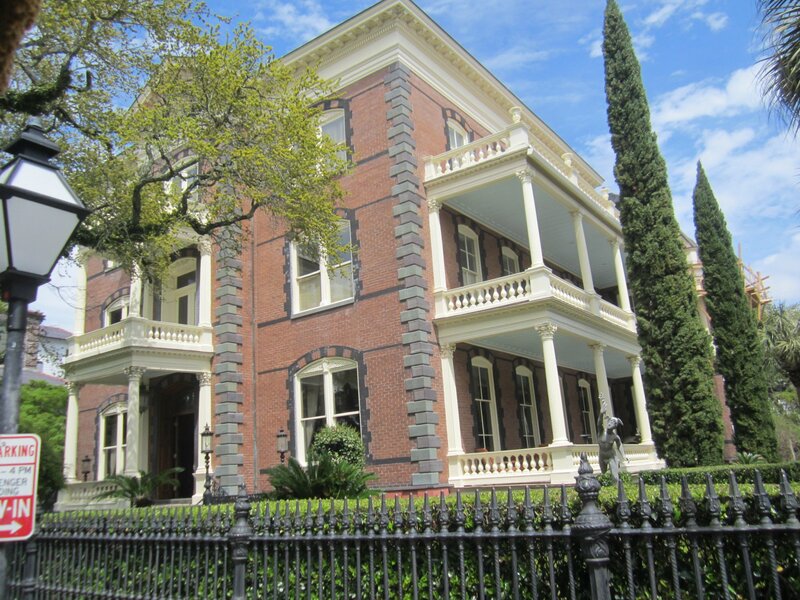 Built in 1924, it was the perfect introduction to Charleston. On our first day there it rained and of course that was the day we planned to walk a lot. However, it didn’t dampen our spirits at all as we took the ferry out to Ft Sumter in the middle of the bay to visit one of our nation’s most historic sites, and where the Civil War began. We also got to see the city from the water, with the same view enjoyed by those arriving in Charleston have seen for hundreds of years. 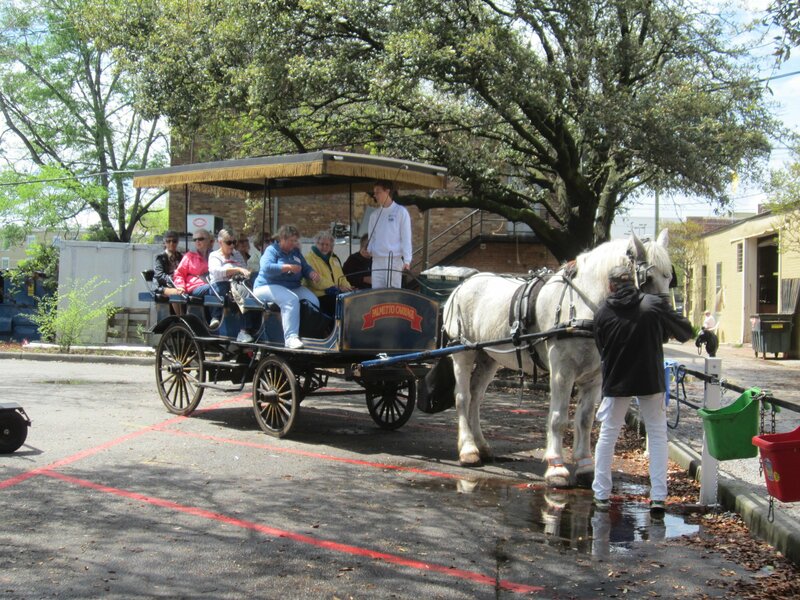 On our return to the city, we toured the city’s historic area in horse-drawn carriages, with drivers who pointed out 200 year old homes, and many beautiful gardens. After a delicious dinner we were visited by Sharon Murray “The Gullah Lady.” Gullah people are descendants of slaves who have made their home on some of the islands around Charleston, and who have developed a distinctive culture all their own. Sharon entertained us with stories and songs of the Gullah culture in a most enjoyable program. 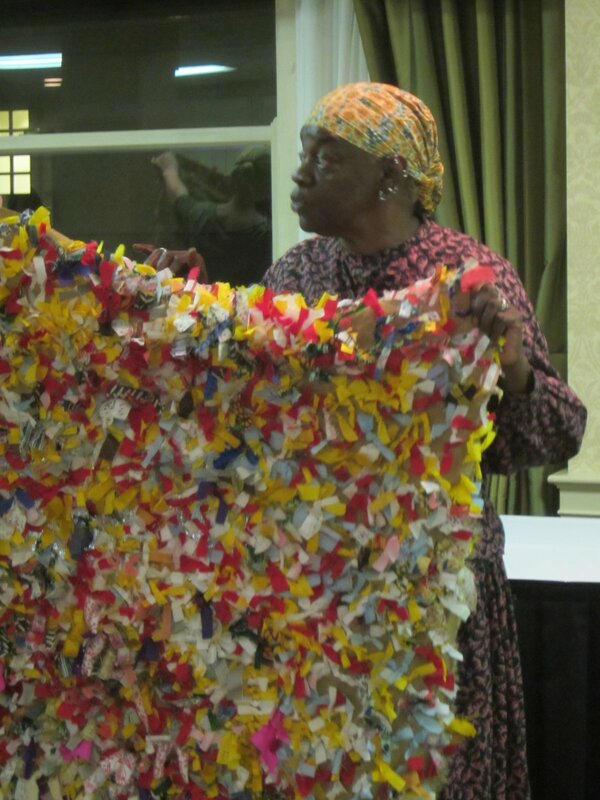 She also brought a sample rug from the Community Rag Quilting Initiative which she began to help preserve this Gullah custom. 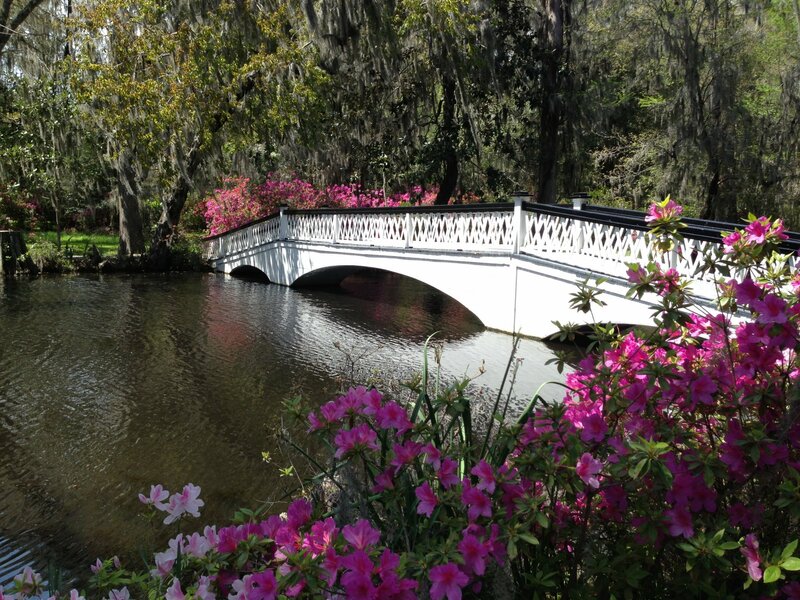 Middleton Place, a National Historic Landmark and home, was next on our agenda. This beautiful old plantation contains America’s oldest landscaped garden, named by the Garden Club of America as “the most important and interesting garden in America.” It was truly beautiful, and full of wildlife as well (several large alligators were sunning themselves on the lawn!). On our return to Charleston, the curator of the Charleston Museum presented a very special lecture on the museum’s historical quilt collection. We departed Charleston for Savannah on Thursday morning with sun shining and a lovely breeze blowing. Along the way we stopped at the only tea plantation in the US – the Charleston Tea Plantation. The factory tour and ride through the fields were very interesting, giving us lots of information on how tea is grown and processed so that it arrives at your door in those little bags. 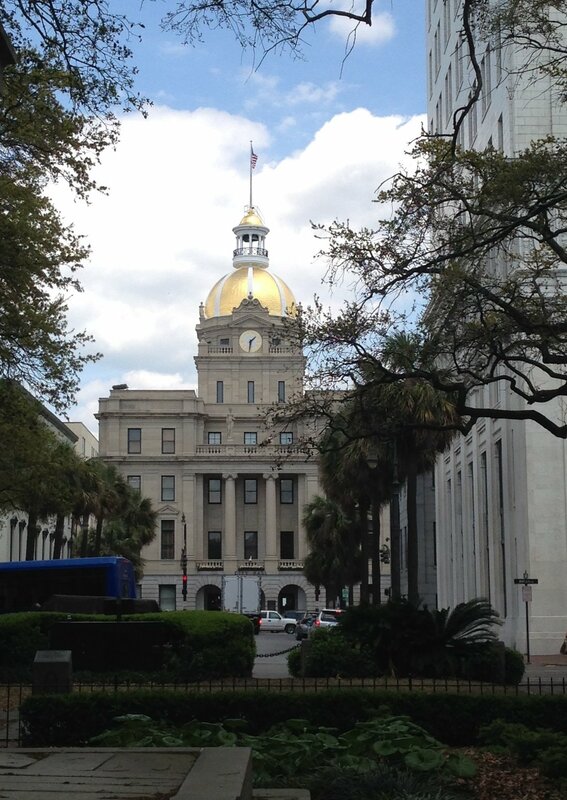 We also toured Beaufort South Carolina, a city renowned for its well preserved antebellum architecture. Savannah proved to be just as beautiful as advertised. Gorgeous antebellum homes set in gardens in perfectly manicured squares, with loads of atmosphere. We were all anxious to get started touring, so on Friday morning we had a bus and walking tour with our guide Harriet, who is really an expert in all things Savannah. In the afternoon we were free to visit some of the historic mansions open to the public (the Mercer House, for instance) or just walk around and soak it all up, or sit in an outdoor café and watch the world go by. Dinner that evening was at the famous Mrs. Wilke’s Boarding House where there were no less than 21 separate dishes of delicious southern cuisine (legendary fried chicken, beef stew, biscuits, etc.) set on each of our tables. We were stuffed! Then it was on to “Savannah Live” a musical revue at the Savannah Theater where a very good time was had by all. The Juliette Gordon Low birthplace and home was next on our itinerary. As the founder of the Girl Scouts, Ms. Low’s home attracts thousands of girl scouts and former girl scouts each year. We toured Bonaventure Cemetery under the guidance of Shannon Scott who entertained us with many stories of the Savannah notables (and some disreputable characters) who are buried there. This cemetery figured prominently in the book and movie, “Midnight in the Garden of Good and Evil.” A trip to Tybee Island with a visit to its lighthouse (where some of our guests managed to climb all the way to the top!) 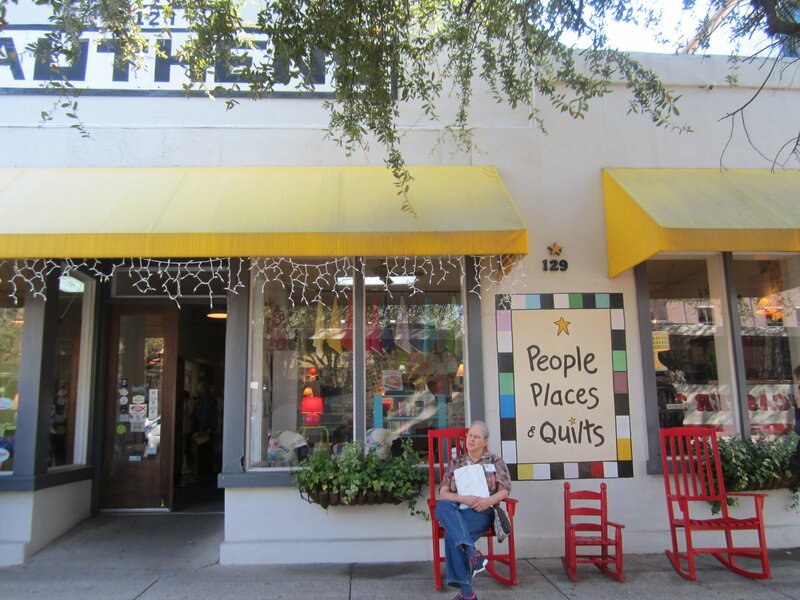 completed our Savannah visit. Our farewell dinner was held at the beautiful River House along the river bluff in downtown Savannah. 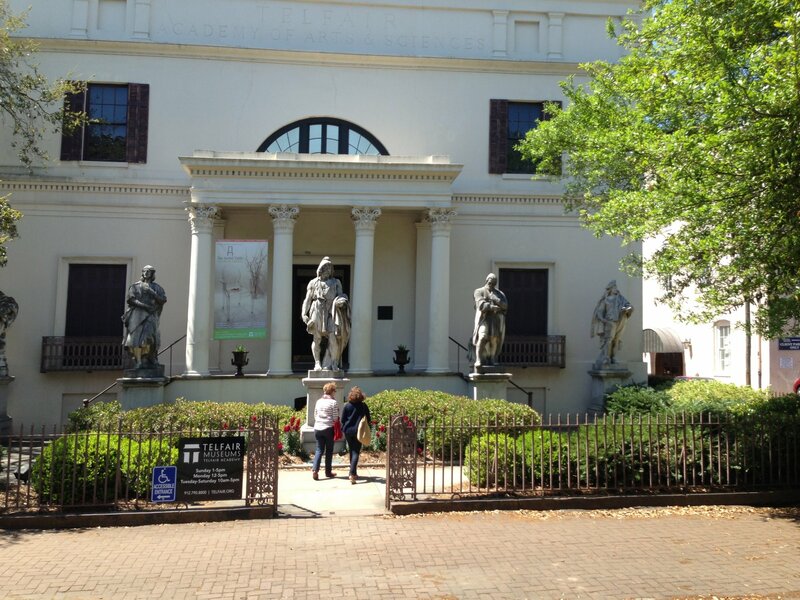 Most of our travelers had not been to either Charleston or Savannah, and we all agreed it was well worth the effort to go as we saw beautiful buildings, lovely gardens and met many gracious people along the way. It was truly a fabulous trip.